This is an easy and delicious one pot meal — a perfect family dish to bring in the fall season. And yes, you read the title right — an easy risotto. This is another take on Ina Garten’s risotto from her book, How Easy is That? 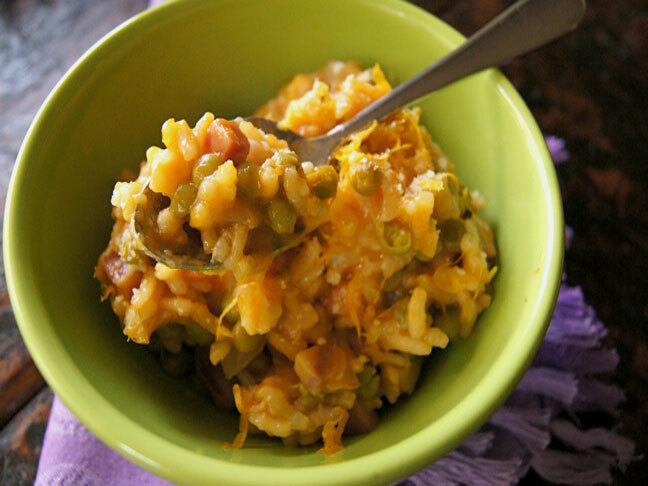 A few months ago I shared Easy Yam Risotto, a great side dish. 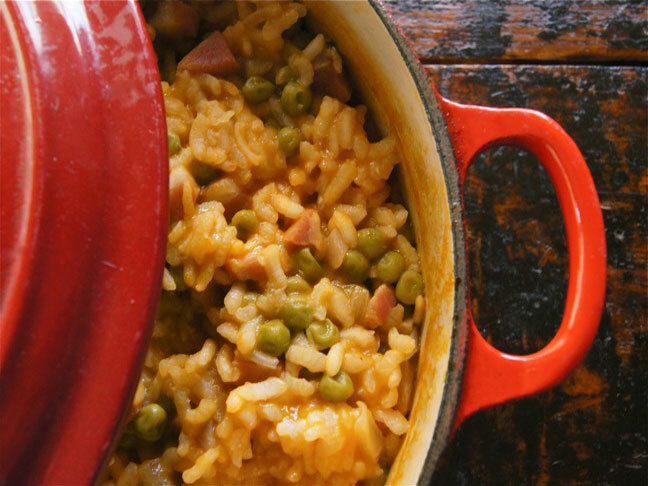 This risotto recipe is slightly more involved and can be served as dinner, on it’s own! It’s rich, creamy, slightly sweet and packed with flavor. And my five year old loves it! Yay! Add the pancetta to a large Dutch oven (i.e., Le Creuset), or another similar style, oven-proof pot with a lid. Turn the heat to medium and cook until it begins to brown, about 3 minutes. Add the onion and cook to soften, another 4 minutes. Add 3 cups of the broth or stock, wine, rice, and peas to the pot. Stir to combine, cover and bake in the preheated oven for approximately 40 minutes, until almost all of liquid is absorbed. Remove from the oven and gently mix in the remaining cup of broth or stock, cheese, and butter. Season to taste with pepper and serve immediately! If you want to make this a few hours ahead of time, save the last cup of broth or stock and mix it in just before serving.